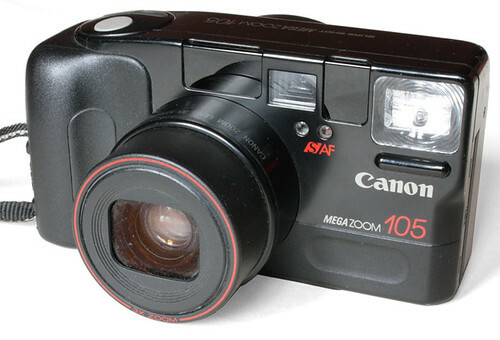 The Canon Sure Shot Mega Zoom 105 (Euro: Prima Zoom 105, Japan: Autoboy Zoom 105) was a March 1991 model from Canon's very successful Sure Shot range. It was a compact 35mm film camera with autofocus and a zoom lens. The camera can use either 'smart' AF or Spot AF focus and has a built in flash unit with red eye reduction capabilities. An upgraded 'Caption' model was available which added a data back and a remote control. The data back has the option to add dates & times or one of 5 pre-determined captions. The remote control slides out of the caption model's body and is rated for approximately 20,000 operations before non user battery replacement. Lens: 35-105mm, f/3.5-8 with smart autofocus. (8 elements in 8 groups). Sure Shot Mega Zoom 105 in the Canon Camera Museum. Prima Zoom 105 Manual at ManualsLib.